Keith Leong completed his Master of Studies in Science and Religion at the University of Oxford recently. He is a member of St Andrew’s Cathedral. 3 Jesus replied, “Very truly I tell you, no one can see the kingdom of God unless they are born again.” 4 “How can someone be born when they are old?” Nicodemus asked. “Surely they cannot enter a second time into their mother’s womb to be born! This is the first of two times that "kingdom of God" appears in John. The other one is in verse 5. The kingdom of God, or the kingdom of heaven, is a common theme in the other Gospels. The kingdom of God, or the New Creation, is seen and entered through the saving cross-work of Christ, received by faith. It is not something that only happens in the future. Living in the kingdom of God begins with Christ and continues in the life of the believer (II Cor. 5:17). The kingdom of God is intimately connected with the concept of “eternal life” in John, which John basically uses as a substitute. We will talk about this when we get to verse 15. For Nicodemus, the kingdom of God would have conjured images of a future reign of the Messiah and God’s plan to redeem Israel. However, this redemption has more of an emphasis on political rule and land ownership. By contrast, Jesus' message focuses on personal transformation in anticipation of the life of the age to come. Everywhere in the New Testament, the emphasis is placed on the latter (see below). So, as you can see, there is a bit of a mismatch here. This echoes that duality that John likes to flesh out in these intimate conversations. God’s future people are conditioned by the future. We are called to life in his kingdom, which means life under his lordship, freely accepted and forgiven but committed to seeing the ethics of the new age worked out in our own lives and in the world. Let us now look at the born-again part of the passage. 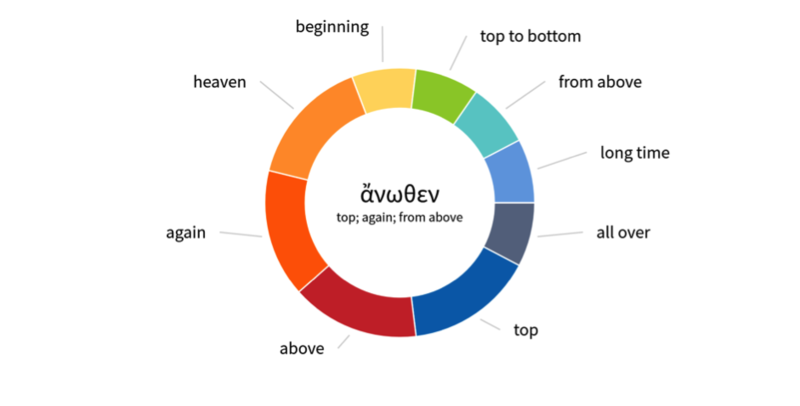 The word for "again", anothen, can also mean "from above". The word appears 13 times in the New Testament and can denote a whole range of meanings (see below). This ambiguity leads to Nicodemus’ confusion. As we can see from the passage, he takes anothen to mean "again". In the next few verses, Jesus does provide some answers. Before we go there, there’s something that needs to be addressed. Some of you who are familiar with biblical history will know that people in 1st century Palestine spoke Aramaic, a Semitic language related to Hebrew and which became the lingua franca, or common language, of the region. This is true of Jesus and his apostles. However, the New Testament is written in Greek. That means that the words in the scriptures are translations of the original conversations that Jesus and the apostles had, including this one. If this is the case, we don’t know how a play on words like this could have been faithfully translated from the original Aramaic. However, we know that John took creative license with his source material, the life of Jesus, to make theological points. Furthermore, because the scriptures are inspired, (II Timothy 3:16) we can and should interrogate the Greek language it was written in to discover theological truths. Let us continue. Jesus was using anothen to emphasize the idea that one must be born "from above" to see the kingdom of God. This interpretation is suggested by the highlighted words, born of water and spirit. At the literal level, “water” and “wind”, which is the same word in Greek as “spirit”, come from above. At the symbolic level, a lot has been written about the significance of the combination of water and spirit. Some think that “water” refers to John the Baptist’s ministry of baptism which was mentioned in Chapter 1. Others think that it refers to the Christian sacrament of baptism. However, both interpretations are problematic. One, it is not at all clear that Nicodemus would have been familiar with John the Baptists’ ministry even though it may be familiar to us. Two, it also implies that baptism is a requirement for salvation. We know from elsewhere in the New Testament that salvation is by grace through faith alone, so this cannot be the correct interpretation. Three, if water baptism is vital to entering the kingdom, why doesn’t the rest of the discussion ever mention it again? Finally, in the Greek grammar, we can tell from the case of the words water and spirit (i.e., genitive) that the preposition “of” governs both of them. This indicates that they are meant to be understood as a conceptual unity, not something referring to two things, baptism and the filling of the Spirit. Therefore, water and spirit are best understood as referring to the Old Testament prophecies about the coming kingdom and the transformation of the heart that will enable people to follow God fully. As a Pharisee well-versed in the scriptures, Jesus expected Nicodemus to get that this outpouring of the Spirit was at hand. In verse 8, Jesus uses yet another wordplay. Spirit and wind are both denoted by the word pneuma. However, there is another more common word for wind anemos. John just as easily could have used the more common anemos to refer to wind, but that wouldn’t flesh out the analogy he was trying to make between the wind and the work of the spirit. Even though the wind can be neither controlled nor understood by human beings living in 1st century Palestine, they could detect its effects. So, it is with the Spirit. We can neither control him nor understand him, but that does not mean we cannot witness his effects on people. Where the Spirit works, the effects are undeniable and unmistakable. I'm sure all of us are familiar with the many testimonies of changed lives that result from faith, including our own. This brings us to our third takeaway: Being born from above through the Spirit is necessary for entrance into the kingdom of God, natural birth is insufficient. At this point we might be wondering, what does this mean? Nicodemus was curious as well. So let us continue with the dialogue, where Jesus reveals the significance of his person. 9 “How can this be?” Nicodemus asked. 10 “You are Israel’s teacher,” said Jesus, “and do you not understand these things? 11 Very truly I tell you, we speak of what we know, and we testify to what we have seen, but still you people do not accept our testimony. 12 I have spoken to you of earthly things and you do not believe; how then will you believe if I speak of heavenly things? Nothing in Judaism prepared Nicodemus for this. Jesus was telling Nicodemus that his descent from Abraham was no adequate ground for salvation. If Nicodemus or the reader does not understand “earthly” illustrations, birth; water; wind, he will not be able to grasp the “heavenly” things which follow, things from verse 13 onwards. Jesus is making a divine claim about himself. He is the one who descended from heaven. He is also the son of Man; the title given to the promised Messiah, God’s anointed who will save Israel. And he is the one who is in heaven. He is not just a teacher sent by God. He came from heaven, and is, in a sense, still in heaven, since he brings heaven, or the kingdom of God, down to earth, so that those who believe in him might receive it. The word for “believe” in Greek, pisteuo, which will appear again in the next verse is important. It has a broader semantic range than the English word "believe". “Believe” in today’s English is to agree with a certain set of propositions. There is a strong intellectual aspect to it. By contrast, pisteuo denotes belief as faith and trust; as having strong confidence or reliance on someone or something. Believing in Jesus is more than mere intellectual assent, it is putting our complete faith and trust in him (see below). The expression "eternal life" zoe aionios also needs to be fleshed out. It's most literal translation is "life in the age to come". As with the kingdom of God, the emphasis is not on quantity, as in a life that never ends. The emphasis is on quality, as in a life where God is himself ruling in love and peace, first in our lives, and then in all creation in the age to come. This is really the climax of the conversation. The verses leading up to the famous John 3:16 passage set the context for appreciating this life-changing truth. The word for love, agape, is in the aorist tense. There are tenses in the Greek just like there are English. The aorist tense is like the past tense in English. It signifies something that has occurred in the past. The scriptures indicate that God's love is an accomplished fact. It reaches back into eternity with Jesus and culminates in his being born into this world. Let us spend some time reflecting on these takeaways. Why does it matter that God reveals himself in three persons? How do I feel about Jesus never turning away a sincere seeker? What does it mean for my life to be born from above by the Spirit?